According to the Islamic tradition, the sword called Zulfikar belonged to Ali, the first Caliph after the death of Muhammed. Zulfikar is one of the oldest symbols in the Islam and according to Shiites its existance goes back to Adam, who carried it out of Eden down to the Earth. The tradition says that the sword once belonged to Muhammed too, who gave it to Ali before his death. The Ottomans adopted the symbolism of Zulfikar, that gradually became one of the main symbols of the Janissaries. It was not only an icon used in the war flags, but was also sculpted as a part of their tombs. I have tracked down the following information in the academically impeccable Encyclopedia of Islam - New Edition (1965), Vol. 2, p. 233. It bears out the important role of the sword in Islamic symbolism. Following is a summary, not direct quotation. My comments are in square brackets. Dhu'l-Fakar [lit. "the possessor of the notch"] was a sword obtained by the prophet Muhammad as booty at the Battle of Badr [in A.D. 624]. It is mentioned in the Hadith, the traditional sayings of the Prophet. The name comes from notches or grooves on the blade, pl. fukra. Dhu'l-Fakar is axiomatically the best of all swords; fine blades produced in Islamic lands have traditionally born the inscription in Arabic, "There is no sword but Dhu'l-Fakar" [an allusion to the first phrase of the Islamic creed, "There is no God but Allah"]. The sword passed from Muhammad to his son-in-law Ali, fourth Caliph in the Sunni succession or first imam to the Shiites, and became a major symbol of his family. After his death, it ultimately passed into the hands of the Abbasid caliphs. The Zulfikar sword shown on flags was commonly misinterpreted by mediaeval European painters (and flag "authorities") as (tailor's) scissors. Such flags with scissors can be found on several old flag charts. Such a flag is labelled on Dutch flag charts as Moorse vlag (Moorish flag); later it became 'Moroccan flag'. An example of the mistake is shown on Bellin's chart (1756) [bel56], reproduced on the cover of Sierksma's book [sie63]. The potential link to Morocco is that the Alaouite dynasty that has ruled Morocco for the last several centuries claims legitimacy on the basis of descent from Ali and hence would be expected to make use of Alid iconography. Whether they in fact did so may require further verification. Another example of an erroneous interpretation of the Zulfikar sword can be seen on the flag of the Great Admiral of the Porte, shown on a 19th century Dutch atlas. Khayreddin Pasha, a.k.a. Barbarossa, was a Greek converted to Islam. He was corsair in the Mediterranean Sea and warlord of Algiers. Sultan Selim I "hired" him in 1519 with the title of beylerbey (Province Governor) of Algiers. In 1533, Suleiman the Magnificent asked him to reorganize the Ottoman Navy and gave him the title of Kapudan Pasha (Great Admiral). Barbarossa supervised the shipyards in Galata, where a powerful Navy was created. In 1534, he seized Tunis, Corfu and the other islands of the Aegean Sea. In 1538, he defeated the joint fleets of Charles I of Spain, Venice and the Pope. Barbarossa died in 1546, short after the siege of Nice with the French Navy. Nice then belonged to Savoy, and François I, King of France, was allied with Suleiman against Charles I. Source: T. Bittar. Soliman - L'empire magnifique. Découvertes Gallimard, 1994. Barbarossa's standard is shown in the Naval Museum of Istanbul and on the Museum website (page no longer available). According to the legend, Hizir Hayreddin (Barbarossa) Pasha's standard was made either during his life time or fifty years after his death. It was hung on the Sarcophagus in his mausoleum and stayed there until it was turned over to Topkapi Palace Museum. It was finally brought to the Naval Museum on February 19, 1976. "Mohammed! Reveal good news to the believers that the conquest is soon." Symbolizes "Allah", the creator of the universe and the three religions and the protector of believers. This symbol is used for various meanings and purposes. Star of David. Barbarossa and the Ottoman Navy were trading with the Jewish merchants during their reign in the Mediterranean and conquest. The provisional supplies were brought from Jewish merchants too. The purpose of the use of this star is to stress the Ottoman reign and protection over regions of Jewish population. The flag dates from the period of Soliman the Magnificent. Soliman the Magnificent attached a lot of importance to his name which means Salomon. Some historians claim that his mother or his wife was of Jewish origin. It was Salomon who repaired the city walls of Jerusalem and built a fortress there. True, the Star of David is part of Islamic culture. But the exclusive use of it by Soliman can be explained with the above factors. * On the upper middle left of the flag there should be a white hand figure like a hamsa, which is obliterated from this picture for some unknown reason. The flag is in light emerald green color with white characters. The red sandjak of the Ottoman sultan Selim I represents the Zulfikar sword. 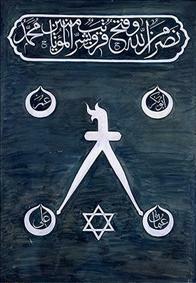 This flag carried to Egypt by Selim I (1466-1520) can be seen in the Topkapi Museum. During the 16th-17th centuries the Zulfikar flags were widespread in Ottoman army and numerous red Zulfikar flags left in the battles in Europe are shown in museums and one can even see a red, triangular Zulfikar flag in the Doge Palace in Venice.